Vikrum Aiyer is the Vice President of Global Public Policy & Strategic Communications for the on-demand technology platform, Postmates. As Postmates creates new opportunities for brick & mortar businesses to distribute their products in the era of e-commerce, it is also shaping the way independent workers and automation is shaping the labor market. Aiyer leads the legislative and regulatory policy discussions at the federal, state, and local levels which impacts the Future of Work in the gig-economy. In this role, he also oversees the company’s social impact & corporate social responsibility arm, Postmates Civic Labs. Previously, Aiyer was as a senior official in the Obama Administration serving as Senior Advisor in The White House for innovation & manufacturing policy, and as the the Chief of Staff to the Under Secretary of Commerce for Intellectual Property. In these capacities, he served as the principal political and policy advisor to the undersecretary of commerce and coordinated a $3.2B budget, in support of 13,000 employees, to execute the daily operations, priorities, and global communications of President Obama’s intellectual property & STEM agenda. In 2016 Aiyer led a U.S. delegation to Cuba to reset relations between the two nations patent offices, and served on Vice President Biden’s Cancer Moonshot Taskforce, to accelerate progress towards a cure by fast tracking immunology patenting. Aiyer also steered investments in several advanced manufacturing technologies including smart fabrics, autonomous vehicles, high performance computing, and next generation semiconductors. He has also served on the communications team of Senator Ed Markey (D-MA); Mayor Adrian Fenty (D-Washington, D.C.); and the Democratic National Conventions in 2012 and 2016. 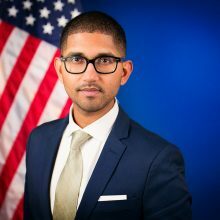 In 2015, Forbes Magazine named Aiyer to the 30 Under 30 list for Law & Policy; and in 2017 Aiyer was named a Public Policy Fellow at the University of Pennsylvania’s Wharton School of Business.